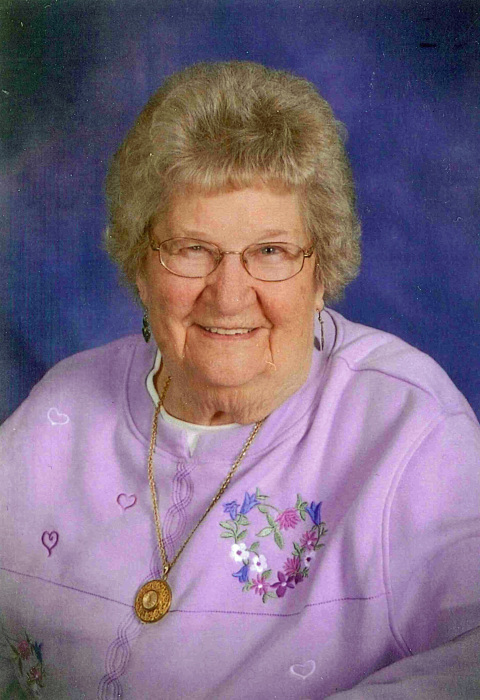 Shirley Mae (Sausen) Anderson, 89 years old of Stacy, MN was called home to her Lord and Savior on March 29, 2019. Shirley was preceded in death by her parents, Harry and Edith Sausen; husband, Sidney; son Richard. She is survived by her children; Dale (Vicki), Linda (Arthur) Spencer, Rodger (Tenny), Gordon (Tammy) and Gerald (Kitten); daughter in law Vickie; 16 grandchildren, 30 great-grandchildren and many loving extended family and friends. ​Shirley, born April 30, 1929, grew up in Wyoming, MN, where she was one of five children. She spent her summers working in their strawberry fields. She married Sidney Oscar Anderson and raised five sons and one daughter on their farm. Shirley had career as a supervisor at Barzen International for many years. She was a long-time member of St. Paul Lutheran church in Wyoming, where she was baptized as an adult. She was active in the Ladies Auxiliary of Stacy serving faithfully in many roles. Her quilts were raffled off annually at Stacy Daze. She enjoyed serving as an election judge in her community. She also served as a DNR fire warden for 37 years. She took fire safety very seriously. She was known for her sparkling blue eyes and fun sense of humor. Shirley had a heart for volunteerism and used her talents to help others. She never came to a party or gathering empty handed. Visitors were always greeted with hot coffee and cookies, bars, or a slice of lemon pie. She was an avid Wild and Twins fan. One of her favorite things to do was go to garage sales with her dear friend Betty. Her hobbies and talents included gardening, baking, knitting, sewing and needlework. She often talked about how it was important to keep her hands busy and many people received the fruits of that mantra. New babies were welcomed with a knitted Christmas stocking and custom baby quilt. New marriages were blessed with a handmade quilt and embroidered kitchen towels. She made many pairs of fleece mittens to keep little hands warm. She will be missed by all who knew and loved her. ​A special thanks to her niece Peggy Sausen, for her devotion and companionship to Shirley while she was in assisted living. She looked forward to your regular visits and you helped her more than you know. We also want to thank the staff at The Meadows Assisted Living, Transitional Care Unit and Fairview Hospital for your dedication to giving Shirley the best care possible. A funeral service will be held at 11:00 am, on Wednesday, April 3, 2019, at St. Paul Lutheran Church, 5879 Wyoming Trail, Wyoming. Visitation will be held from 4-8, on Tuesday, April 2, 2019, at Mattson Funeral Home, 343 North Shore Drive, Forest Lake, and will continue an hour prior to the service at the church on Wednesday. Burial will take place at St. Paul Lutheran Cemetery immediately following the funeral service.